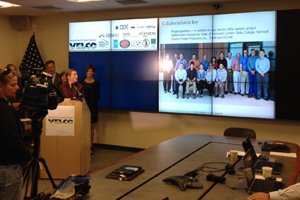 Rutland, VT—Vermont Electric Power Company (VELCO) today briefed state and federal emergency responders on a project underway that utilizes IBM’s leading-edge Deep Thunder technology to create a Vermont Weather Analytics Center. The Center will initially help unlock additional renewable energy value and serve as the basis for follow-on projects that bring additional benefits to Vermont, such as improving grid resiliency and storm response. Work on the $16.6 million, two-year project started eight months ago and builds on VELCO’s administration of the eEnergy Vermont smart grid project and the company’s construction of a 1,300 mile, 72-strand statewide fiber network. Collaboration is at the heart of this project and project partners include: IBM Research; every Vermont electric utility; Lyndon State College through a grant from the Vermont Low Income Trust for Electricity; the Vermont Electric Power Producers Inc. (VEPPI); the Department of Public Service, VTrans and other state agencies; UVM and ISO-NE. The project is built around a Vermont-specific version of IBM’s Deep Thunder predictive weather model coupled with a renewable energy forecasting model and an energy demand model. These models apply leading-edge analytics to in-state and regional weather data to produce accurate weather, renewable energy and demand forecasts. Currently, the weather model produces forecasts 48-hours in length at a two-kilometer resolution , making this the first state-wide forecast at a high temporal and spatial resolution. “Renewable energy production has a strong dependency on weather; likewise, energy demand also depends on weather; therefore, high resolution, high accuracy forecasting will be a key enabler of the coming transition to clean energy,” said Chandu Visweswariah, IBM Fellow and Director of IBM’s Smarter Energy Research Institute. Dunn pointed the project’s embrace of renewable energy: “Smaller scale, or distributed, generators of renewable electricity have arrived. They now play a critical and growing role in balancing supply and demand and we want to be able to accelerate their integration into grid operations.” VELCO’s Weather Analytics Center Project does that by coupling the output of the Deep Thunder model with an innovative IBM renewable energy forecast model. This model will utilize data on in-state solar and wind farms to produce more accurate renewable energy forecasts. These forecasts will be used in turn to optimize the value of Vermont’s renewable generation, demand response and transmission resources.